The standard interpretation for mid-oceanic ridges is that they are stationary spreading ridges. However, that mid-oceanic ridges have always been spreading ridges is false. One fact that points that out is that the return flow in the mantle at spreading ridges is missing in seismic interpretations, showing that the power source for this “permanent spreading ridge” is missing. This is contrary to predictions of the spreading ridge theory. Another clear feature that shows mid-oceanic ridges are not permanent spreading ridges is the shape of the mid-oceanic ridges that surround Africa: mid-oceanic spreading ridges are supposed to be stationary, pushing continents away. But since Africa is completely surrounded by spreading ridges, Africa should move in “every direction”. Since this is not possible, spreading ridge theory cannot be correct. Considering there had been a full one-sided meteor bombardment on earth (and the rest of the solar system) and a single event of continental movement, a large part of the mantle should have been temporarily exposed. – a completely bombarded area on one side: now the Pacific ocean. In this part of the world the majority of the crust was blasted away, and/or got pulverized and mixed with the (impact-molten) mantle. – exposed mantle due to continental movement on the other side of the earth: now the Atlantic and the Indian oceans. Directly after the bombardment and continental movement, these area’s were completely filled with hot molten lava. That solidified and eventually formed the oceanic crust. 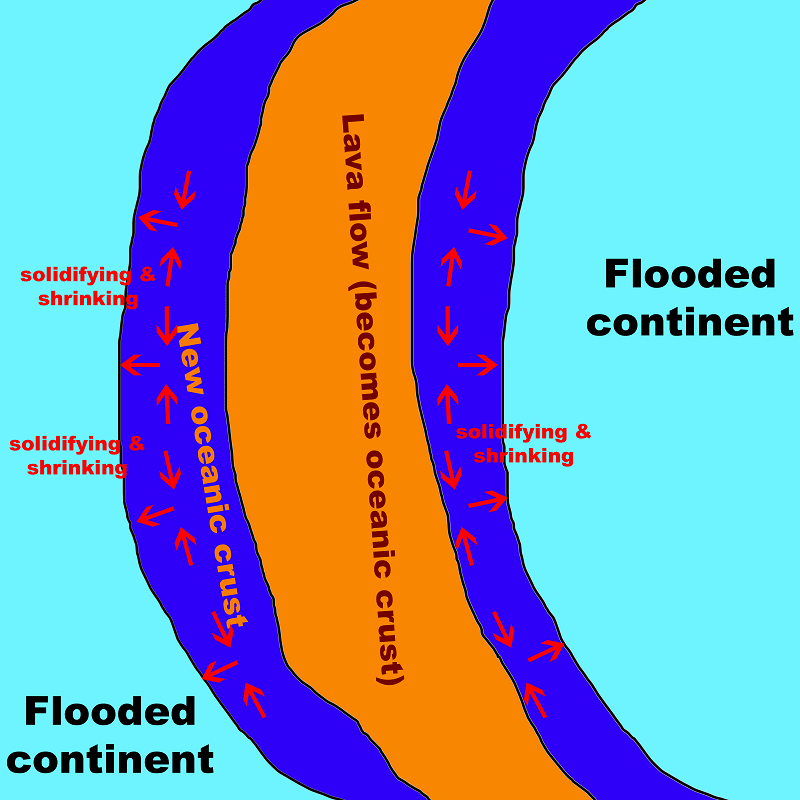 The lava had temporarily boiled the ocean away from there, thus causing the rest of the crust (now called “the continental crust”, broken into plates by the same event) to be covered in water. So the result of this event is a cataclysmic global flood. Not a single part of the continents was dry, and the majority of the world was covered in molten lava. The moon and mars had been bombarded by the same meteor bombardment. So they have had a large area covered in lava as well. For example, almost the entire near side of the moon is covered in basalt, which is clearly related to impact basins. Still, the oceanic crust of the earth has a totally different shape than the basalt plates on the moon. The reason for that: the moon does not have an ocean. 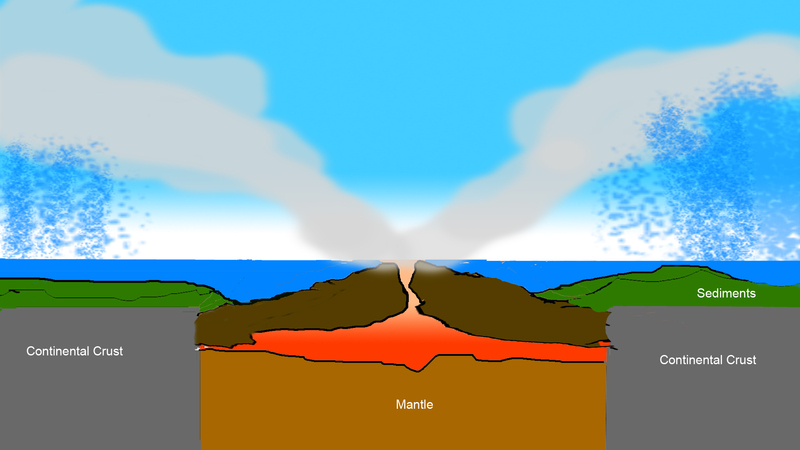 The ocean played a big role in the eventual shape of the basaltic (oceanic) crust on earth. Mars seems to have had an ocean, but it appears to be vanished. On this page is an explanation on how the oceanic crust on earth could have formed its patterns. On earth, the oceanic crust shape could have been influenced by water. Consider the continents to be flooded, and the oceanic crust to be not solidified yet. In that case, thermal radiation is able to expose the heat of the lava towards the universe, like in the image below. 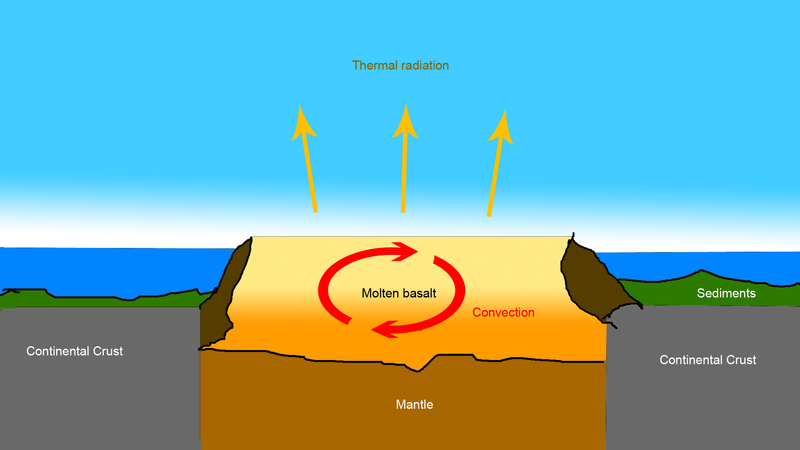 Molten lava is 5% less dense than solidified basalt. 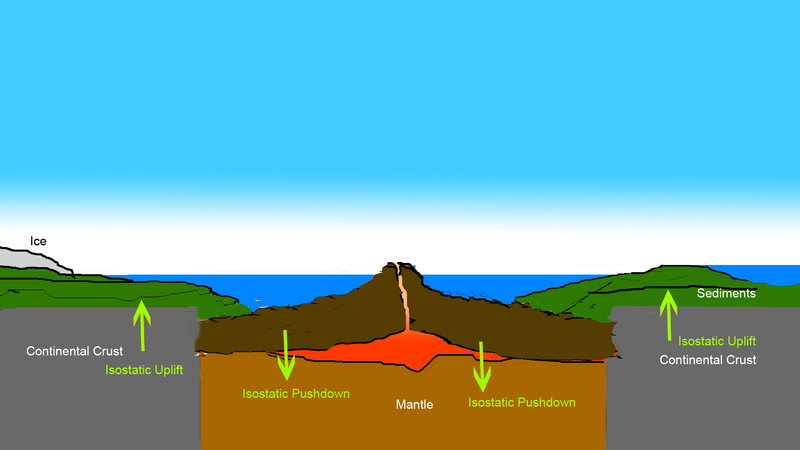 So isostatic balance would chance once the lava starts to solidify. This is the theoretical process. 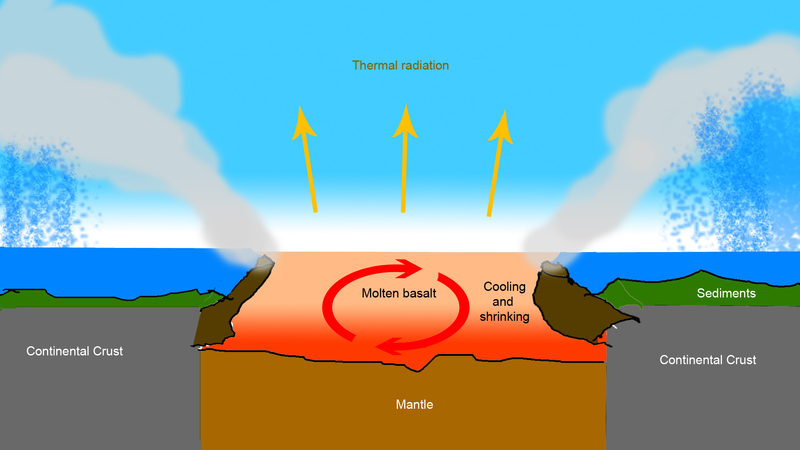 If the cooling process would only be thermal radiation, the crust would be solidified within about 1.5 to 2 years. 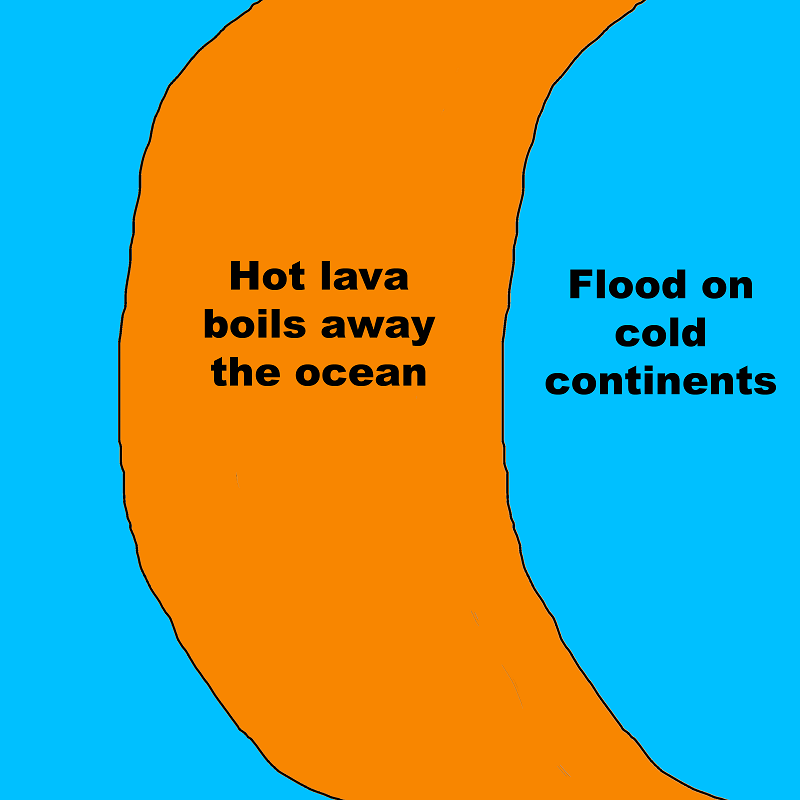 What seems more likely to happen than the first image: the ocean would come of from the continental plates and enter the lava, enhancing the cooling mechanism. extreme rainfall would occur as long as large parts of the lava have not been covered with a strong new crust. This process deposits a lot of sediments on the continents. The oceanic crust would hardly have any sediments on it, because there simply wasn’t water on top of it at that moment. (This is in accordance with what we find on earth: much less sediments on the oceanic crust than on the continental crust, and lots of sediments on the part of the oceanic crust that is directly attached to continental crust) Afterwards some erosion occurs, and a bit of that sediments are deposited on the fresh oceanic crust. The weight of the water itself pushes the lava towards the middle. This process continues until the gap is closed. In the middle, two plates would be leaning on each other, thus forming the mid-oceanic ridges as a closing seam. A much slower process of isostatic push-down and uplift would slowly dry the continents. In the end we have the situation as we find it on earth today. Beside mid-oceanic ridges, there are also other patterns on the oceanic crust. For example, there are perpendicular lines to the mid oceanic ridges. You can see that on the image below (click on it to enlarge). So how do these patterns end up on the mid-oceanic ridge? When something solidifies, it shrinks (in most cases). 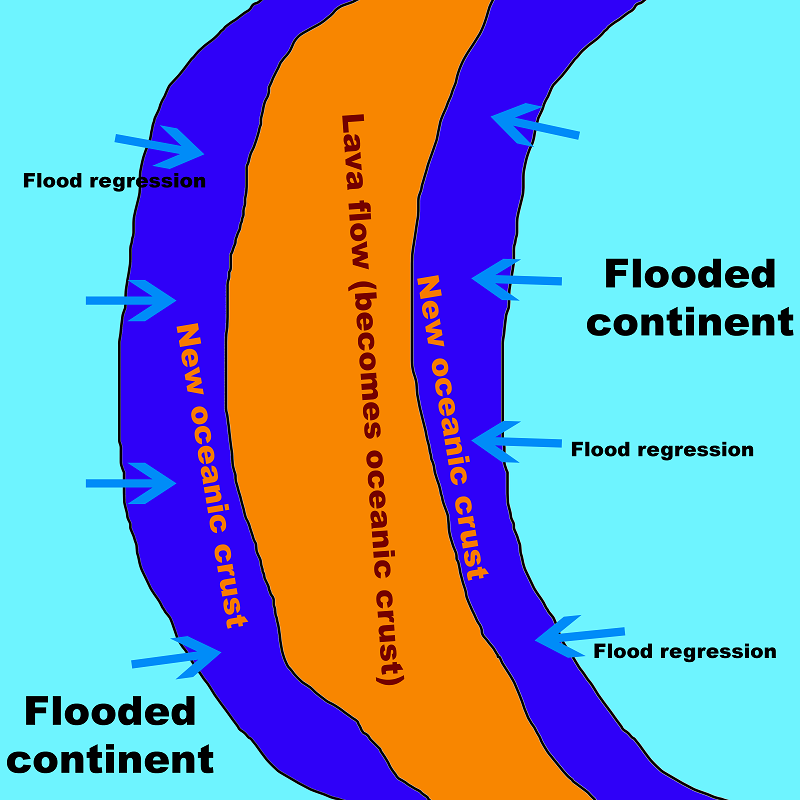 As shown in the illustrations sequence above on this page, the mid oceanic ridge can be a closing seam, because flood water came from the continents, pushing the lava flow to the midst of the ocean. 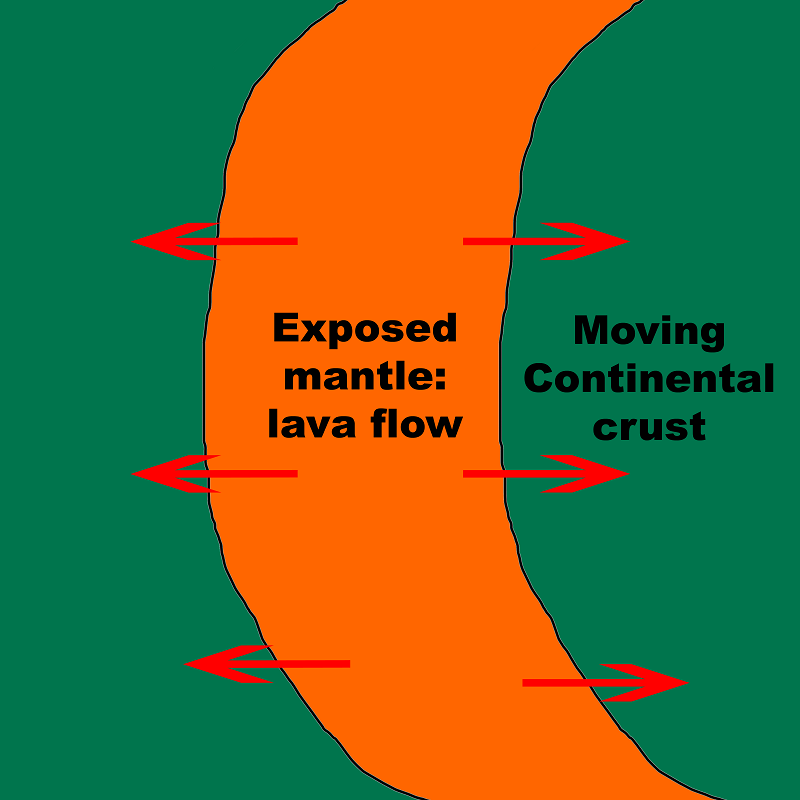 Shrinking of the crust due to solidification generates a pulling force on the crust. 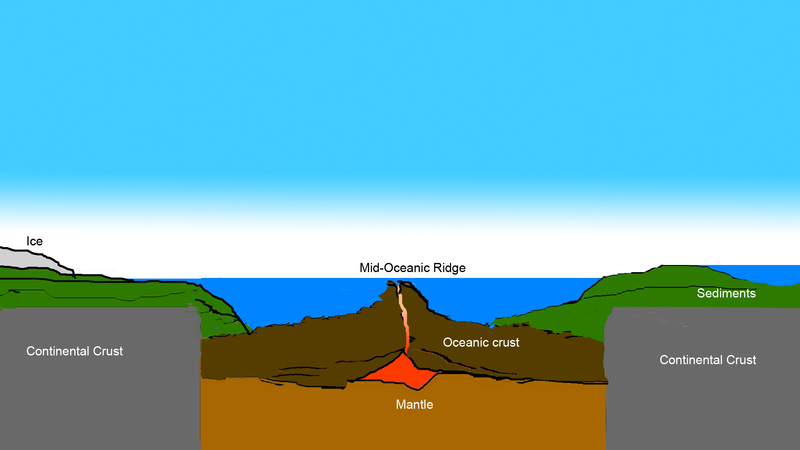 On one side, the newly formed solid oceanic crust was attached to the continental crust. The other side was not attached, so the shrinking process pulled the loose end of the oceanic crust somewhat in the direction of the continents. However, perpendicular to that, there is no loose end, so this does not work. 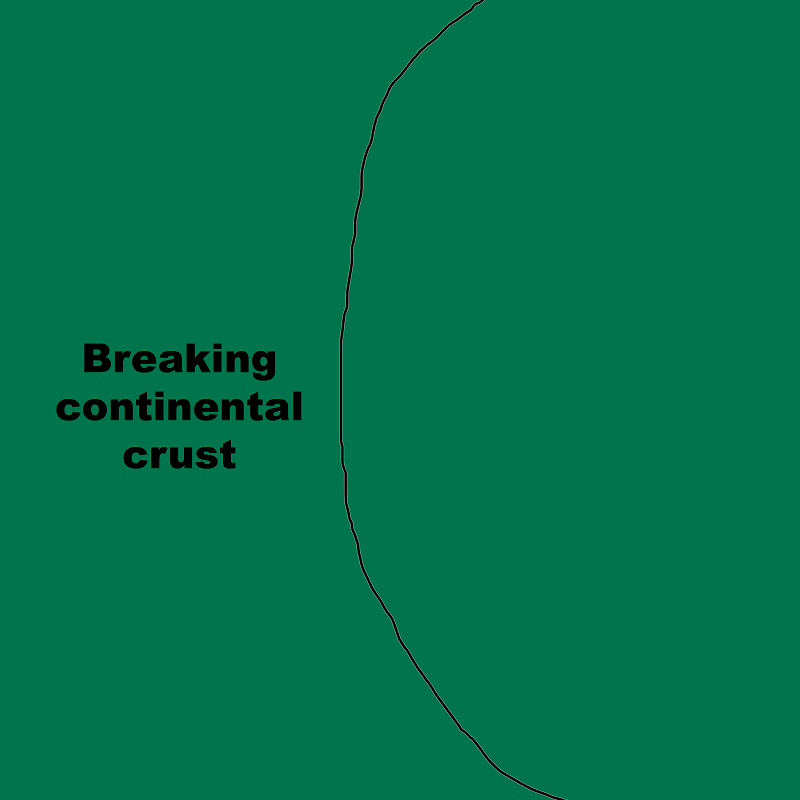 The shrinking would cause tension to the new and fragile crust itself, causing it to tear cracks in it. Those cracks are then of course in line with the water flow direction (pointing towards the continent), perpendicular to the area that was not attached to anything (i.e. eventually the mid-oceanic ridge). Hot lava would exit those shrinkage cracks, and thus channel the water. This explains the entire pattern of the oceanic crust. 1. the earths crust breaks. 4. Once the lava starts to cool down a bit, the flood slowly regresses onto this lava. 5. The solidifying lava shrinks. It pulls in the direction of the red arrows. 6. Cracks form due to shrinking of the solidifying crust. 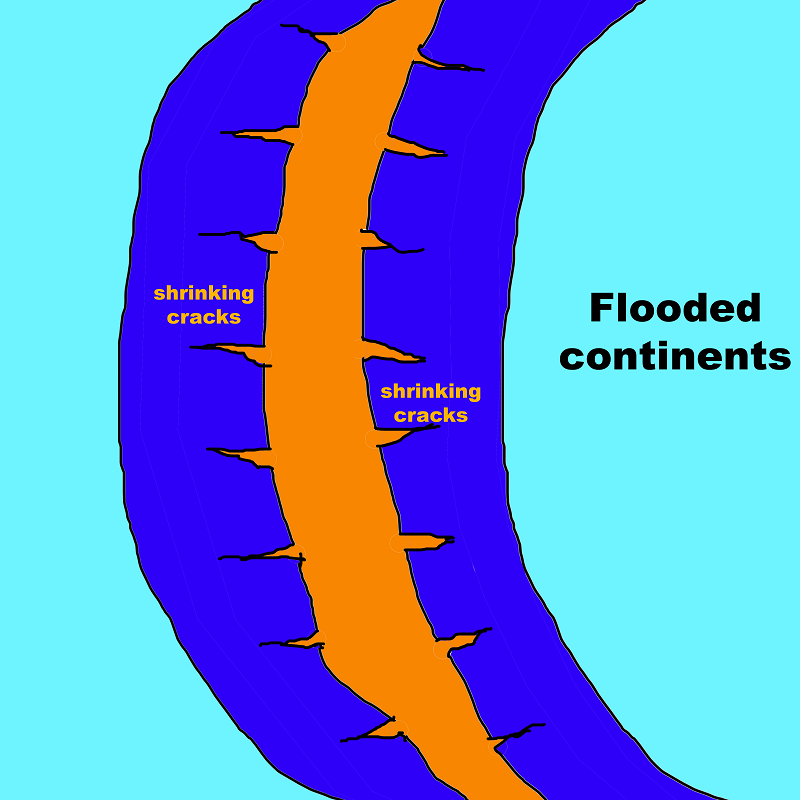 The cracks are pointing towards the continents, because the stress only occurs in 3 of the possible 4 directions (the fourth, “mid-oceanic” part is not attached to anything, so it is not pulling). These cracks also channels the water. 7. The mid oceanic ridge forms as a closing seam. Why are mid oceanic ridges not always in the middle then? That would be because of the water flow from the continents. That is dependent on the path of least resistance. For example, the America’s have very big mountain ranges on the west side. Those mountains were blocking the water. So the water flowed more easily towards the Atlantic than the Pacific. Asia has much less mountains on the east side than America on the west side, so the water could more easily flow from there. Water was able to leave Eurasia on both the west and the east sides. So water that flowed from Asia pushed the mid-oceanic ridge in the Pacific more towards the America’s. 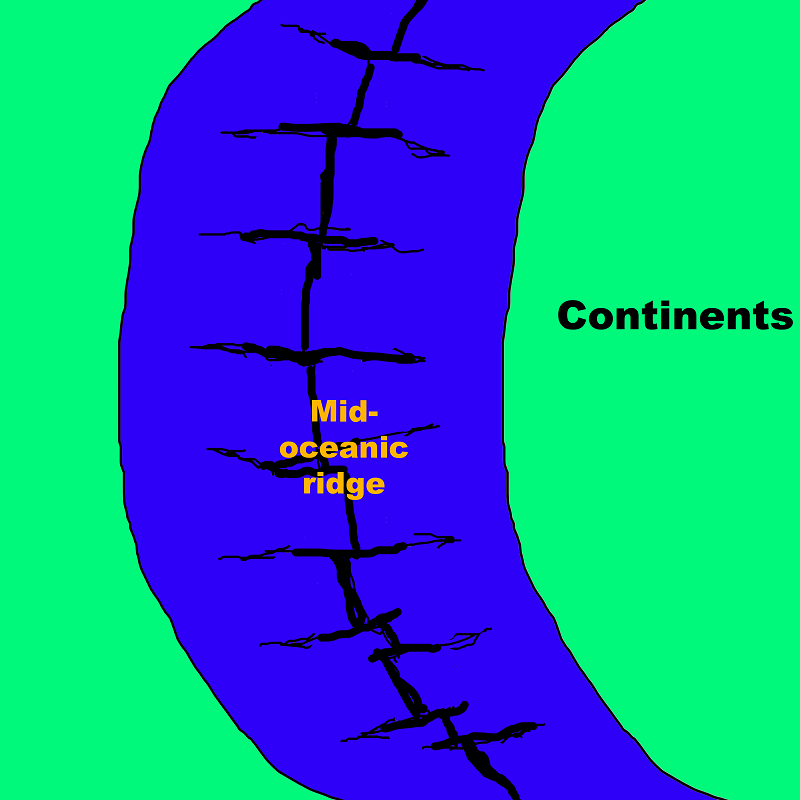 In the Atlantic ocean, the mid-oceanic ridge is in the middle because water regressed from both sides. Since the mid oceanic closing seam is the weakest part of the oceanic crust, any residual movement would cause this area to spread. This is why it is witnessed as “spreading ridge” today. But this does not mean it has always been like that. Ocean crust formation by meteorites bombardment? – Nonsense! –	presence of hydrocarbons large sources in cosmos and in unusual Earth’s depth. –	nucleosynthesis (formation of nuclei of the Periodic Table) occurs, not only in Sun and in stars, but also during supernova explosion. Would concluded that the matter causing nucleosynthesis is an cosmic ultradense shape of matter that must be placed as ultrathin geo-spherical kernel of the core, just at bottom of the molten geo-sphere. Through its disintegration the particles and ultra-particles disintegrate from the ultradense state and are reconstructed in atom nuclei and heat. 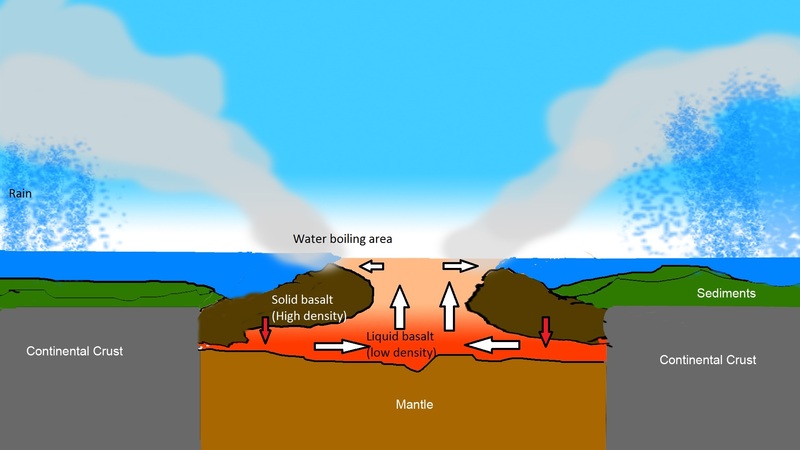 So is formed magma, through its differentiation and movement inward and upward the Earth’s geo-spheres grow including oceanic crust around continents. If you watch it, you’ll see that I agree with your statement that it is made of magma.